The Fellowship of Suffering | Study the Bible with me! The Thessalonians were experiencing extreme trials. Paul emphasized the reality of their situation in 2 Thessalonians 1:4-7. He was communicating: I know you are suffering. I know you are being persecuted for your faith. I know you are being afflicted. My study of 2 Thessalonians 1 has led me to understand that the beautiful prayer below is Paul’s prayer for the persecuted church of the Thessalonians. 2 Thessalonians 1: 11 And in view of this, we always pray for you that our God will consider you worthy of His calling, and will, by His power, fulfill every desire for goodness and the work of faith, 12 so that the name of our Lord Jesus will be glorified by you, and you by Him, according to the grace of our God and the Lord Jesus Christ. 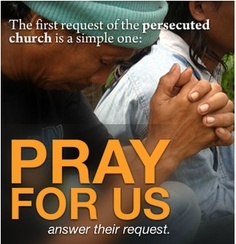 In 2013 and the years to come, we still need to pray for our brothers and sisters in Christ who are being persecuted. This entry was posted in Bible, Thessalonians and tagged disciples, faith, persecution, prayer, suffer, THESSALONIANS, women's Bible study. Bookmark the permalink.